Find 10 fire salts to restore Balimund's forge. Balimund needs Fire Salts for his forge. If you speak to Balimund at his forge in the center of Riften and ask him about how proud he is of his work, he will tell you that the forge is not as good as it used to be. It is supposed to run on fire salts, but they seem to be wearing off. He estimates that he needs ten fire salts to get the forge back to its original strength. Details on where to find fire salts are provided on the ingredient page. Once you have ten salts, return to Balimund and receive a leveled amount of gold. You cannot give the salts to Balimund one at a time; you have to give all ten to him at once, or else the dialogue option will not appear. Completing this quest will allow you to begin the dialogue to marry Balimund. Even though Balimund says that "only genuine" fire salts will work, they are not like the bloodgrass for the Vampirism Cure Quest in Oblivion (e.g. where bloodgrass purchased in a shop doesn't count). 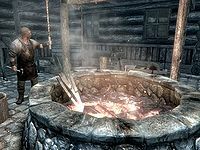 Instead, fire salts from any combination of sources will work—from flame atronachs, purchased from merchants, stolen, and/or crafted at the Atronach Forge. Even though the in-game story is that the fire salts make the forge stronger, neither Balimund's merchant inventory nor the things you can craft at his forge receive any upgrade in quality after completing this quest. The amount of money in his store does increase, as if you had invested in his store (if you have already invested in it, or if you invest later, the two effects do not stack). On the PC, it is possible to use the console to advance through the quest by entering setstage FreeformRiften10 stage, where stage is the number of the stage you wish to complete. It is not possible to un-complete (i.e. go back) quest stages, but it is possible to clear all stages of the quest using resetquest FreeformRiften10. Esta página foi modificada pela última vez à(s) 20h22min de 1 de setembro de 2015.